Dedicated to providing the community with safe, clean and affordable non-profit housing. 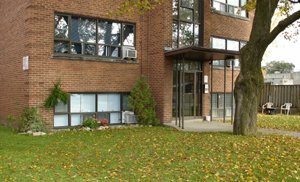 Welcome To Kalmar Cooperative Inc.
Kalmar Cooperative Incorporated is a non-profit housing complex of seven three story buildings that are located in Toronto, at 1546 Kingston Rd., between Birchmount and Warden Ave, on the North side. 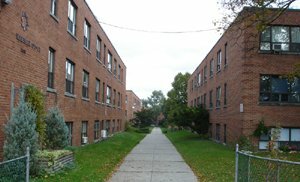 The buildings consist of 111, one and two bedroom apartment units. No elevators. No balconies. On the positive side: The TTC stops right in front of the complex and it can take you to the subway or to the streetcar. We are close to schools, shopping areas and parks. The housing charges (rents) are very affordable. They include utilities, and cable. Limited parking spaces are available. The complex is safe, clean and well maintained. The apartment units range in size from 460 square feet to 570 square feet. Most still have the original hardwood floors. Kalmar is managed by a volunteer Board of Directors and full time staff. For more information see the navigation links above.